Once upon a time, pre-election day (was that 10 years ago now? ), Julie Houts’ Instagram was our favorite semi-serious, semi-satirical illustrated account of the fashion world. Her fashionable drawings, met with her dark sense of humor, were both gorgeous and hilarious. But when the world came to a halt, she didn’t shy away from saying what was really on her mind—and we couldn’t be happier about it. 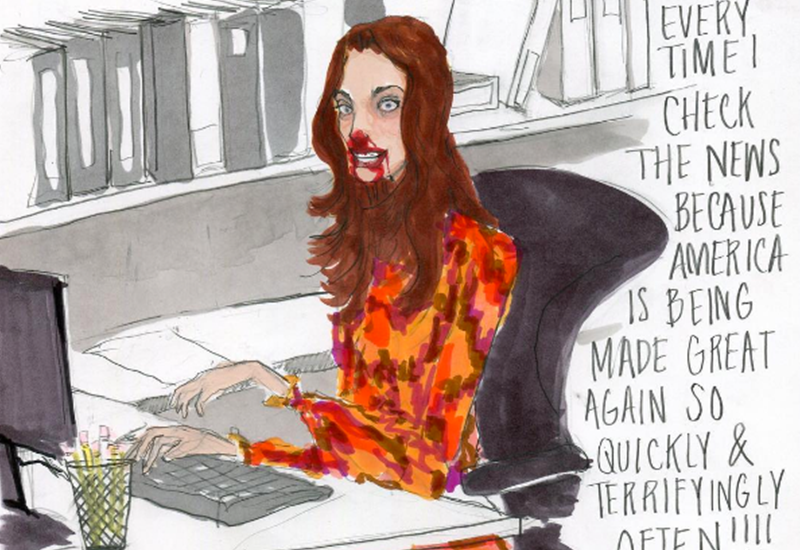 Now, it’s still our favorite illustrated account of the fashion world, but it’s got a serious bite. Behold. And FFS, follow this brilliant woman. 1. That time she perfectly satirized the fashion and beauty world attempting to take on our soul-crushing loss in a ~fashionable~ way. Like, how do you post your #spon posts next to your #imstillwithher posts without seeming insincere?! 2. When she understood our feelings about the situation perfectly. If anyone tries to tell me “She was just as bad as him!” ever again I swear to god I’ll bite their head off. 3. When we started adjusting to our new way of life. My eyes were also bleeding from refreshing Twitter in hopes that it would somehow save me (spoiler: it did not). 5 and 6. That time she dragged Steve Bannon (twice) in the darkest way possible and we loved it. Important groundwork for when we forcibly drag him out of the white house. Keep up with Julie Houts’ latest art on Instagram @jooleeloren and watch for her debut book, coming from Touchstone this fall.